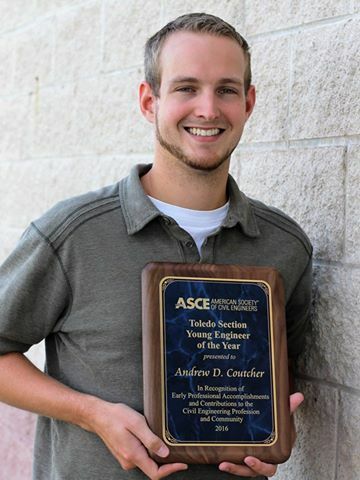 Drew Coutcher - ASCE Toledo Section Young Engineer of the Year! DGL would like to congratulate our very own Drew Coutcher on his recent award as the ASCE Toledo Section Young Engineer of the Year! In addition to his professional career at DGL, Drew is also very involved with the ASCE serving as the Practitioner Advisor for the student chapter of the organization. As a former student chapter president and vice president, he continues to work closely with those that are working toward completing their FE exam and also is involved with various project tours, showcasing different aspects of civil engineering. Congratulations, Drew, on this outstanding accomplishment!